Good morning all. Our April Guest Designer Janice Melton is joining us today with an lovely Mother's Day card! 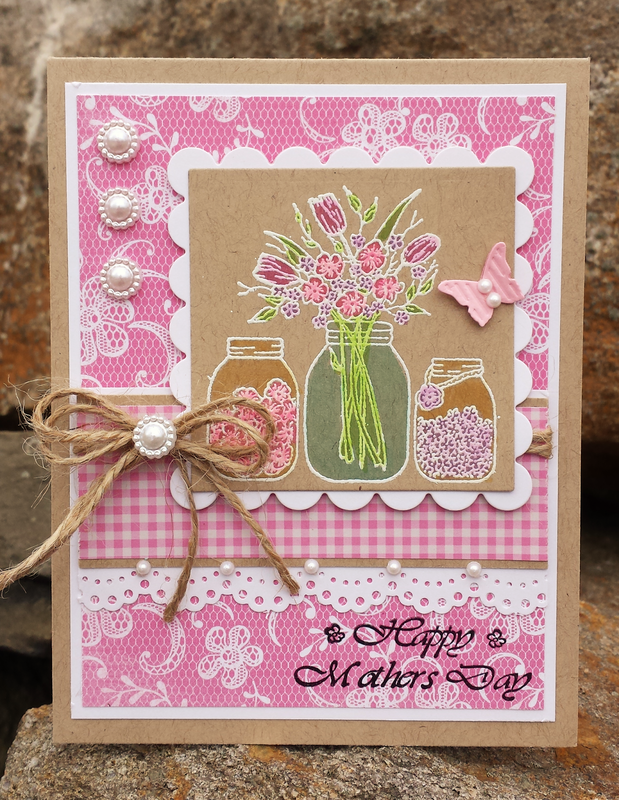 For my card today I have used the beautiful Spring Floral Jars (G363). I heat embossed the image in White on Kraft cardstock and colored it with my Copics. Found this lacy paper in my stash and thought it went perfectly with this image, paired it with some Gingham and twine. Finished it off with some pearls. The Happy Mother’s Day sentiment (B190) is also heat embossed but in Black so that it stands out more. Thanks again for letting me share my cards with you'll this month! Such a beautiful card! I love the embossing on craft cardstock, along with her coloring and design with the lovely lacy paper. Janice did an amazing job! Make sure you stop by Janice's Blog to leave her some love! Our Great Impressions April Challenge is live! Hop on over for all of the details, and join in the FUN! We can't wait to see what you create this month! What a lovely card!!! Beautifully done - thanks for sharing! Wonderful card. Love the layout and colors.